If your caught my interview on Clear the Decks’ podcast you may remember me mentioning feeling that, compared to my knitting materials which are very well organised, my sewing materials were in a bit of a state. After investing in a new sewing machine and completing enough projects over the summer to feel that I am genuinely a sewist again, it was about time I did something about it. There were lots of reasons why I had been deterred from tackling what sounds like a simple task of sorting through fabrics. Firstly, I had never had a place to keep all my sewing supplies together. 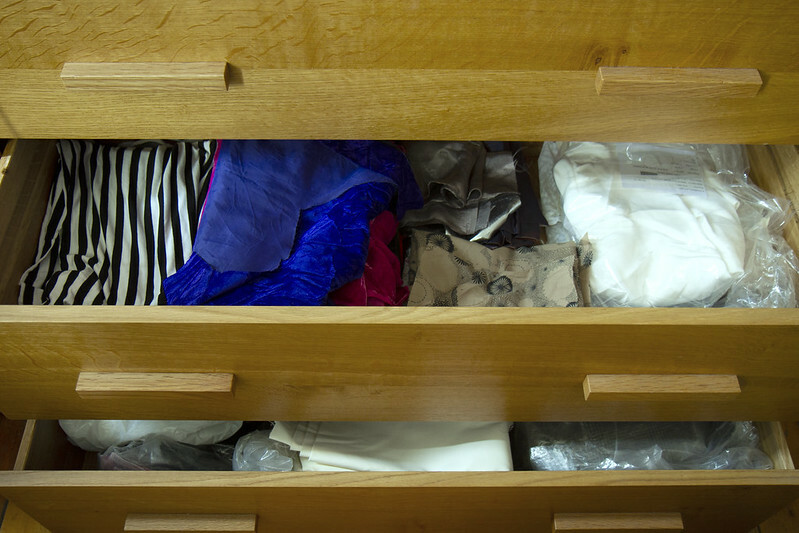 Fabrics had been stored in various boxes and chests-of-drawers because that’s where there was space. The problem got worse after moving house when they ended up distributed all over the place. In other words, I had no idea of the scale of the task, which is all the more daunting. Secondly, although my fabric buying has never been extravagant, over the years I’ve done many different and very specific types of sewing, and I had many supplies dedicated to these particular pursuits. For example, I used to have a small side business making bags from vintage fabrics, so I collected a vintage curtains and furnishing fabrics, as well as brightly-coloured lining fabrics, zips and trimmings specifically for this purpose. At another time I had a job that required smarter dress, and I love tailoring, so I gathered lots of suit fabrics and patterns. I feared that revisiting all those sewing supplies would be a trip down memory lane that I wasn’t in the mood for. But probably the biggest hurdle, which had prevented me from having a clear-out previously, was not knowing what to do with all the things I didn’t want, and this felt like a huge, impending burden. I must say a big thank you to my friend Nadia Arbach of Clear the Decks for the Decultter Your Sewing Space podcast for giving me the tools to overcome this particular obstacle. I know I have plugged this many times over the last few months, and rightly so: the podcast has so many practical tips for actually disposing of your unwanted things reasonably (by biggest fear was that useful things might end up in landfill). For me, this was a big help because I could decide objectively “do I want this?” without worry about what to do with it if I didn’t. A childhood of making patchwork Christmas decorations from tiny pieces of fancy fabrics had trained me to keep leftovers, but I could recognise that these were not useful to the sewing that interests me now, and were very unlikely to be useful to anyone. These, along with damaged pieces went to the textile recycling bank (hopefully some of it will end up being recycled into low-grade but useful materials like insulation and padding). There was still a huge amount of stuff in the destash pile and, while assigning a monetary value to things is a mindset that often contributes to clutter, there were some beautiful and collectable pieces that might be worth selling. There were also a lot that weren’t, but might be useful to someone, so I separated those out. 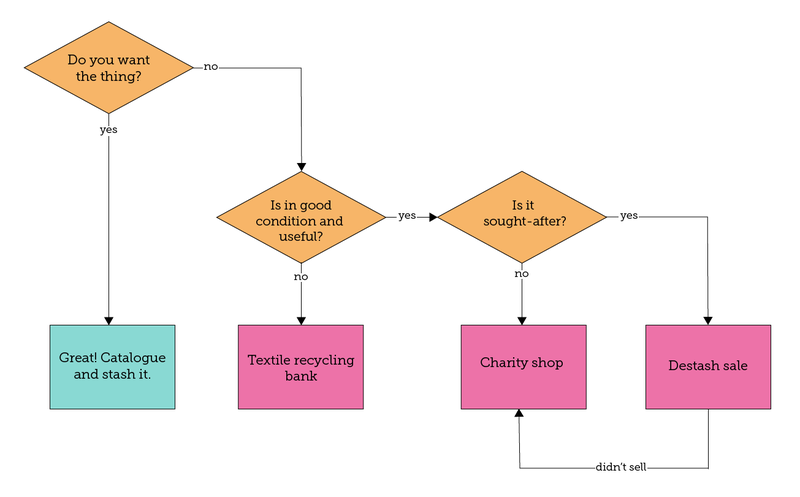 Many charity shops don’t accept fabric remnants, but I learned from Declutter Your Sewing Space that Salvation Army shops do, and I also discovered that my local one is a favourite with quilters looking for fabric. I trundled off there with a trolley and a rucksack full of fabrics, patterns and trimmings (honestly, there was so much), which were gratefully accepted. The weird thing is, that despite it being mountain of fabric, I am struggling to remember a single thing that was in that pile. It turns out that fabrics don’t carry the emotional baggage I feared they might. I was left with about two boxes worth, with which I decided to hold a destash sale on eBay. That meant measuring, photographing and listing 21 items. I’m not sure the value of these would have justified the work for me, but I was not doing it for my own financial gain – my destash sale raised money for Women’s Aid, which made it totally worthwhile. Some of these pieces were quite substantial (the largest was 4.5m long), some unusual (hand printed Tahitian cotton), totally unique (a custom digital print of my own design), expensive (lots of British-woven suiting) and special in other ways (leftover bridal lace and ribbon) and I felt that the deserved good homes, and homes they found! I intended to announce the sale right here on the blog, but most of the pieces sold before I had the chance! The vintage fabrics I had collected for bag-making disappeared particularly quickly. The current total stands at just under £100 raised for Women’s Aid, which I am thrilled about. 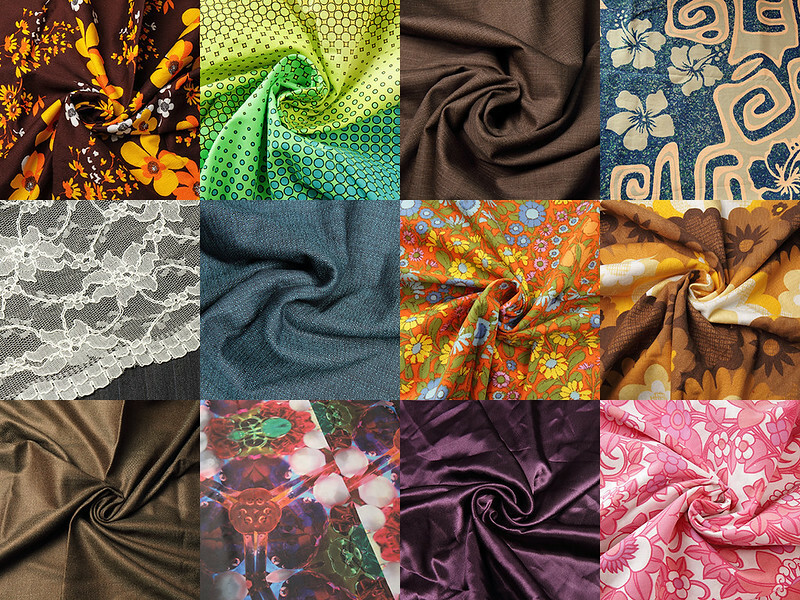 I do still have items remaining in the destash sale, including beautiful wool suit fabrics. I will close the sale in a week or two and everything that’s left will go to the lucky Salvation Army. So that just left the stash pile… Going forward, I need to keep my fabrics organised in a way that will avoid me amassing embarrassingly huge volumes of material I don’t need and can’t remember. I decided to sort everything by usage: lightweight dress fabrics; silks; heavy dress fabrics; linings; novelty and furnishing fabrics; interfacings etc. To my surprise, everything fitted, neatly organised, into the two drawers I allocated. Success! Neatly organised stash drawers! Hopefully it will stay this way. Most importantly, before being put away, every piece was photographed, measured and catalogued into my Textillia stash. I’d by lying if I said this wasn’t laborious, but now I can browse my stash from anywhere and see exactly what I’ve got and how much of it there is. Having a similar catalogue of my yarn stash on Ravelry has worked really well for me over the years. 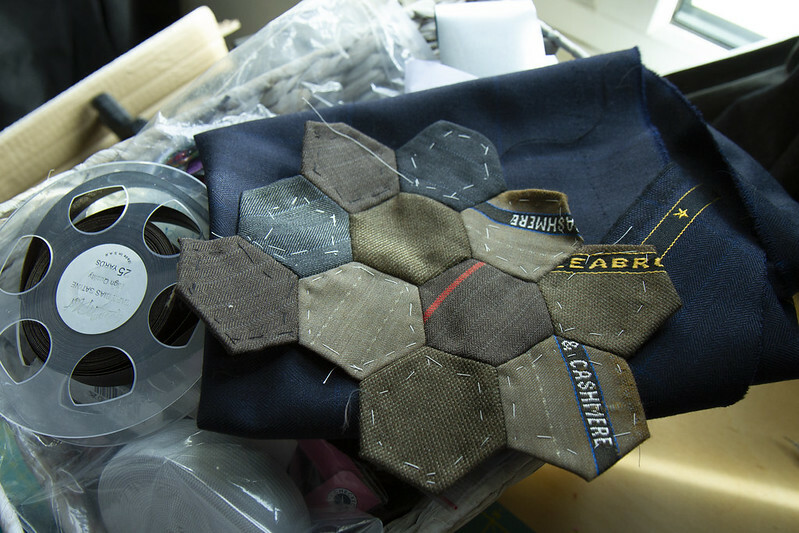 I unearthed one or two forgotten but cherished projects, like this patchwork made from suit fabric selvage (can you tell that I really do love my suit fabric?). It also brought back memories of all the things I have made over the years and it adds up to an incredible amount of sewing. Over the summer I’ve been tackling relatively small, stress-free projects, but remembering the large and complex things I have created has given me a confidence boost. It feels great to have decluttered, to know what I have and where everything is. The pieces in my stash are things I am excited about using. And I have freed up insane amounts of cupboard space – the mind boggles that I could have been storing so much fabric without realising. I have a bag for the textile recycling bank under my sewing table. All of the smaller-than-useful pieces go straight into it as soon as they’re created. These pieces no longer go back in the stash. When I’ve finished a project, if there’s a useful-sized piece of fabric left over I give it away immediately. Even if I love the fabric, it seems unlikely I’d want a second garment in it when I have so many other lovely pieces waiting to be used. Fingers crossed I can keep up the momentum!